"I use Tinderbox for pretty much every project I take on, from preparing and teaching college courses to developing music recordings and performances. "My work involves sourcing, writing, editing, and harvesting news stories on the arts and co-ordinating their publication in two e-mail bulletins per week. I run a stable of a couple dozen writers and am constantly recruiting new ones, and also have to integrate content with co-editors in Melbourne and London, not to mention keep up with rapidly changing plans coming through my Executive Editor from the new owner and CEO. "Tinderbox is essential for keeping track of all the different kinds of information I need to process -- I really don't know what I'd do without it. 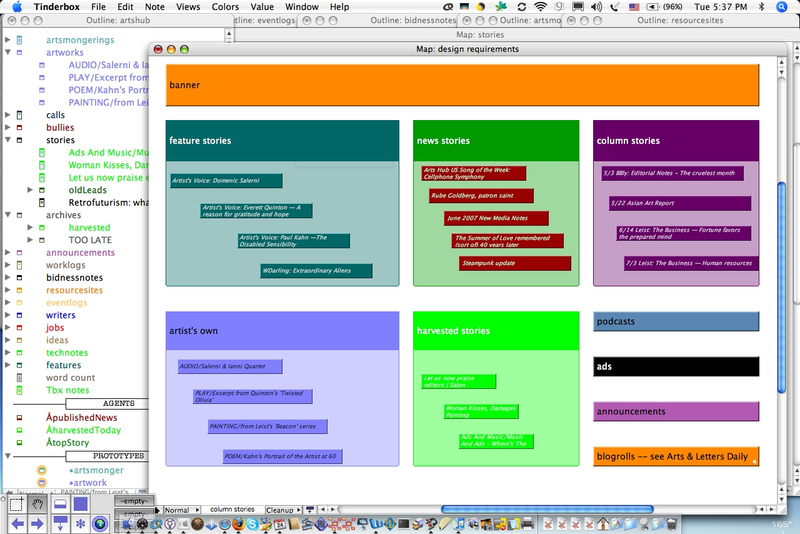 This Tinderbox document serves as a dispatch center for incoming stories, a virtual news desk. The large, colorful adornments organize the map; as new stories and interesting URLs arrive, the adornments suggest where they fit into the ever-changing news map. At the same time, the adornments aren't just boxes in a chart; each is an active assistant that sets an appropriate prototype for the new note and stamps them with routine metadata. Once the bulletin is published, the editor drags old news into the archive, making room for the next batch and again automatically updating time stamps and status. 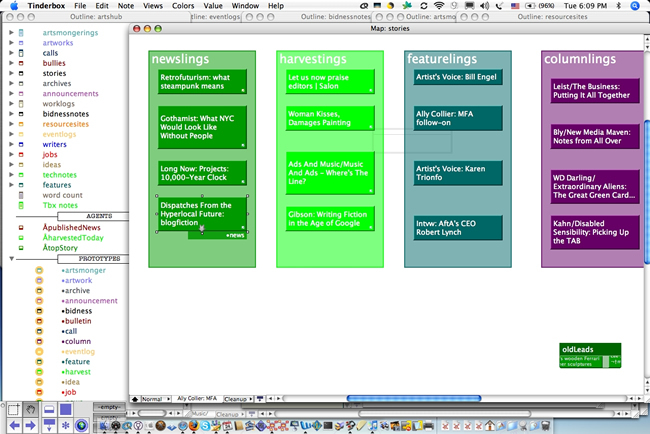 Tinderbox agents let me tag top stories for my editorial summaries, and keep track of when stories were published. Bly doesn't limit his personal assistant to helping with news room workflow. He's also thinking about new features and new designs identifying unmet needs and contemplating how his publication could meet them, and how he can convince his publisher to do so. "This design requirements screenshot shows a schematic of my ideas for a site redesign -- when I finish fiddling with it, I'll copy the view picture as a slide and use it in a presentation to make my case."